Gloucester Harbor was the perfect setting for members of the Ogden Codman Design Group to enjoy a day of historic interiors and tours. The group of designers, antique dealers, historians, and design enthusiasts first toured the Beauport, Sleeper-McCann House, the summer home of Henry Davis Sleeper, one of America’s first professional interior designers. Beauport recently received a new shingled roof and underwent significant work to restore the landscape to its original Arts and Crafts style. 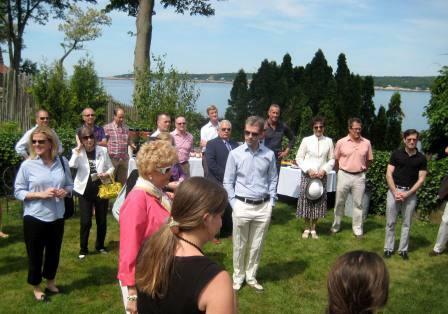 After touring the collections and curiosities of Sleeper’s Beauport, guests enjoyed a summer luncheon on the terrace overlooking the harbor. Next the Ogden Codman Design Group received a special tour of Stillington Hall, a privately owned home with interiors designed by Sleeper. Guests were treated to a rare comparison of the pioneering designer’s work at these two locations. This event was hosted by the Ogden Codman Design Group, a Historic New England membership category for design professionals and enthusiasts. Learn more.